Grandparent's Day is coming up this Sunday! Don't let it pass by without giving your kids the opportunity to show their grandparents how much they love them. For a grandparent, just spending time with their grandchildren is special, but it never hurts to sweeten the deal a bit. Here are some of our suggestions for celebrating Grandparents Day. Create a family tree together. 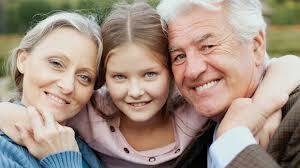 Have your child interview their grandparents about their siblings and parents. Use photos to make the tree come alive. Compile a CD or playlist of songs from their youth. Add some of your child's favorite songs too and listen to them together. Plan a movie matinee to watch grandma or grandpa's favorite movie as a family. Create a poster or giant card titled "Why We Love Grandma and Grandpa." Have the kids list reasons and include colorful illustrations. Make it a tradition. Even if it just means going out to dinner, having a game night, or visiting them at home, find some way to make the day something grandparents and kids look forward to year after year.